This label uses indentable aluminum so your writing lasts after the ink is gone! • Aluminum labels have writable surface. • Customize these labels yourself. Write your school or company name in blank pad. 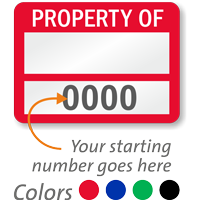 • Select your label color and starting number. • All labels will be numbered consecutively beginning with your starting number.